Rahät Loukoum was launched by Serge Lutens in 1998. The fragrance was inspired by the thick jellied candy that is popular as lokum in the Middle East, and known in the Western world as Turkish Delight (for a brief history, see the Turkish Delight entry in Wikipedia). It was created by nose Christopher Sheldrake, and the notes include fresh white almond, crushed cherry pits, hawthorn, heliotrope, Turkish rose, balsam, tonka bean, aldehydes, white honey, musk and vanilla. Rahät Loukoum opens with tart cherry and a big dose of alcohol. As has often been noted, it smells pretty much like cherry cough syrup. The almond notes intensify over the next few minutes; the notes indicate "fresh" almonds, but to my nose they have the almost smoky scent of just-toasted almond slivers. 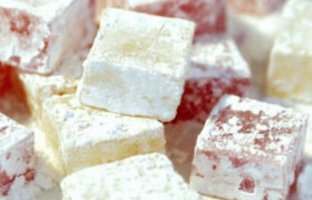 I was fairly certain I had never tasted Turkish Delight until I went searching for pictures of it; now I am fairly certain that I have, but I have no memory of the taste so I cannot say to what extent the fragrance evokes the candy. To me, the early dry down calls to mind a plate of crunchy Amaretti cookies, very warm and nutty, with a glass of Kirshwasser (cherry brandy) on the side. After a half an hour, the cherry is a mere whisper. The almond is also calmer, and accented now with vague hints of dried rose petals. It is more milky than doughy at this stage, and the finish is soft and fuzzy, but not quite powdery. There is a touch of vanilla, and a lightly honeyed musk, but the sweetness is restrained, and it smells less and less like food the longer it is on the skin. Rahät Loukoum was the first Serge Lutens fragrance I tried, and I was immediately hooked. It was, I think, my introduction to the whole idea of a comfort scent: something to wear not because it is pretty, exactly, but because it is soothing, and evocative, and perhaps even calming. I find it almost addictive. When I first started reading the fragrance board at MakeupAlley, a frequent topic of discussion was finding a suitable substitute, given that Rahät Loukoum is expensive and hard to get your hands on if you live in the United States (see below). In my humble opinion, there is no reasonable substitute, but there are other fragrances worth trying. Lady Evangeline, by the Lousiana perfumery Lagniappe Oaks, is one possibility. It is flatter and doughier, and lacks the cherry note, all of which may or may not be a good thing depending on your personal taste. Givenchy Oblique Rewind is often compared to Rahät, and to Luctor et Emergo by The People of the Labyrinths, and I suppose you could say that the three are distant cousins. Oblique Rewind smells like a combination of cherry cough drops, cherry pipe tobacco, pistachio and honey. It is an interesting scent and I have been meaning to revisit it, although I am not sure whether it is still in production. And of course, there is Keiko Mecheri Loukhoum, which is a soft, very powdery vanilla musk. It is no doubt a captivating scent if you like powder. Unfortunately, I don't, so have nothing else to add. Do comment if it is a favorite of yours. Rahät Loukoum is in the Serge Lutens exclusive line; for buying information, see the listing for Serge Lutens under Perfume Houses. Rahat Loukoum was not an instant love for me, probably because it is very musky in the drydown. However, I grew to like it for all of the reasons you mention–it is soothing and comforting. RL was the first SL I tried. I used to layer it with People of the Labyrinth for that ultimate sweet fragrance. Blech – now that I think of it. I have to admit this is not a favorite although it is original and for that reason alone, worthy of a try. Thanks for another wonderful review. My journey to Rahat mirrored yours. It was my introduction to the category of “comfort” scents. It was also my first gourmand scent. One of the reasons why I never want to be without a bottle is because Rahat always lifts my spirits. There's something happy and calming at the same time. Also, it is a year-round fragrance that works anytime except for very hot temperatures. If this was easily available, I would wear Rahat more often. As it is, I dole out the juice in my lovely bell jar. I really can't think of a good substitute for Rahat, R. KM's Loukhoum comes close, but it does not have the cherry note and is just not the same. I hated Rahat the first time I tried it. I later figured out that my decant was probably spoiled. I purchased another one this year and love it! I wish it had better lasting power, don't you? My precioussss…Thank you for this review, R! As for substitutes, of the ones you listed, I think only Loukhoum comes close, though it is a “nuttier” or more powdery scent. I am a big fan of Oblique RWD and I will testify in front of a jury that it smells nothing like RL I would also add Sweet Oriental Dream by Montale to the list of good substitutes for Rahat Loukoum. Hi R – yet another fab review. This proves my sensory u-turn – I hated this for years and now I love it. I have yet to splurge on a full bottle. It is an extremely comforting perfume. V, I have often wondered if I would have explored the rest of the line if I hated Rahat. It certainly would have saved me a lot of money if I decided SL wasn't worth bothering with, LOL! T, let me know if you find a Turkish Delight that is worth trying, and I will order it too. It sounds so nice in theory. M, forgot about the Montale. Someone on MUA described it as a love child of Escada Collection & KM Loukhoum, and I would say with a bit of Rahat thrown in as well. N, I do the same. It makes me wonder sometimes if I will just eventually end up liking everything…hope not, can't afford it! I've only sniffed this from the wax sample, and wasn't sure. But your great review suggests the juice might be a lot better? I have a sample of KM Loukhoum, and simply hate that – blech! I'm hoping the SL is less…whatever the sweet horribleness is…than the KM. N, I don't like the KM either. They really are barely related to each other. The SL is less sweet, and WAY less powder. Very much worth a try! R, I only have a wax sample & I really like it, I´m thinking about ordering sometime in the next months. I like the cherries very much. I´ve an allergic reaction on PotL, so I can´t wear it. The drydown is very nice, but I can´t say that I like the Play-doh aspect at the beginning (I think I´m not the only one). But I seem to be the only one who really loves KM Loukhoum! On my skin it isn´t that powdery – I wouldn´t care too much if it was, though, because I like powdery scents. It´s more of an almondy-vanilla scent with a bit of powder. It´s one of my favourites for winter wear! One last thing: Today I´m testing Eclix & I like it, it´s not too “mainstream” at all, but a soft citrus scent – a bit powdery & very comforting. All I get from this is Cherry Pipe Tobacco. The SL Rahat Loukoum has too much cherry for me, but it's a wonderful perfume. FYI, The Divan Roasted Pistachio is the best edible Turkish delight I've ever had. A friend brought it back from Istanbul and this website sells it. Even though the box gently explodes with powdered sugar when you open it, it is not too sweet, and the roasted pistachios give it a toasty edge. All my life I've been interested in the idea of Turkish delight, but not the reality, and I have a few boxes from other brands aging on the top of my cupboard, so when I finished a boxful of the Divan T.D. in two days, I knew it was a cut above the rest. S, I think Loukhoum is a big seller, and it has lots of fans on the fragrance boards, so you are certainly not alone. I just don't like so much powder. Glad you like the Eclix!! Thanks so much, am off to check it out! I hated it when I first tried it, then after 2-3 tries I fell in love. I dislike the powdery synthetic smell of KM Loukhoum on me. I like POTL but SL RL is much more intense and long-lasting. I get easily 8-10 hours from it. You are lucky, T, it really doesn't last that long on me! It's the *only* foody perfume I like. I sold decants of it a couple of years ago and my flat smelled like the most delicious pâtisserie for days and days. I find it innocent and “clean” somehow – there's no sour or powdery “aftertaste”. It's lovely. K, I am seeing it at perfumebay, but it certainly isn't widely carried at the discounters. Not sure I'll invest without trying it again. I hope you manage to do that very soon. So glad you love it! Rahat is in the exclusive line though, so you're not going to find it at Les Senteurs. See the listing for Serge Lutens under Perfume Houses (menu at top). Holy moly, I just received a sample of Rahat Loukoum in the mail and it's so sublime my heart is exploding. You're right about the tart cherry in the beginning and the milky almond stepping in on the dry down. Having never had the pleasure of eating Turkish Delight, I instead picture the pulled open center of an enormous bon-bon, pale pink and fluffy, flavored with cherries, almonds and honey. It's a bit chalky, like there's a dusting of powdered sugar over everything. I'm sincerely in love. How nice! I do wish SL would make RL the limited edition export one of these years…it's a shame it's so hard to get in the US. Do try it if you can! Kevin just fell in love with it too. My sample arrived yesterday. I'm annoying my boss, who sits opposite me, by continuously smelling my wrists and 'plumping' my shirt so that the scent wafts up from my chest. I've never worn a 'foody' scent before, and I'm not sure I'll be buying a bottle. But I am enjoying the experience of wearing it, I have to say. It is a novelty. It reminds of a cake we have in the UK – Mr Kipling's Cherry & Almond Slice. Which, believe me, isn't nearly as glamorous as Loukhoum….. If you find it too much, you might try the similar but much lighter Louve! Thanks. I will definitely give it a go. I remember you recommended that as a cheaper substitute if Rahat didn't work out. I received samples of Fumerie Turque and Chergui as well, and am really having fun sampling them each day. I've been enjoying my experimentation so much, that I ordered samples of Cuir Mauresque, Muscs Koublai Kahn and Iris Silver Mist to try next……..However, I cannot rid my mind of the delicious dousing of Douce Amere i experienced a few weeks ago. I reckon that, as I keep thinking about it obsessively, it means I love it enough to try again – and then purchase a full bottle! Thanks for your advice Robin. Always appreciated.